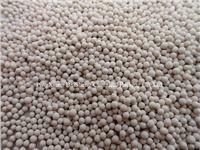 Gu-13X Molecular Sieve is Mainly used to eliminate thioalcohol of organic sulfur (thiaalcohol) in aviation kerosene. Application: Mainly used to eliminate thioalcohol of organic sulfur (thiaalcohol) in aviation kerosene. 4 h-1 at air velocity. The nominal length of φ3.0 to 3.3 mm strip molecular sieve is 6 to 14 mm. (2)The water content in package refers to that before delivery from manufacturer.